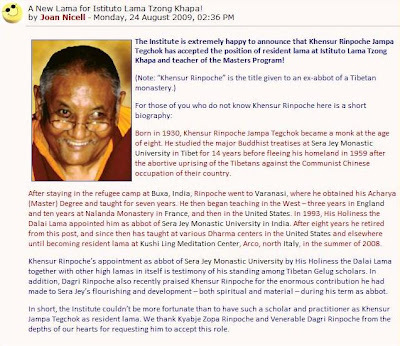 We, the monks of Sera Jey Ngari Khangtsen ( Education Society ) are happy to inform to all friends and visitors to our website that Ven.Khensur Rinpoche Jampa Thegchok, the abbot Emeritus of Sera Jey Monastery University, was appointed resident lama at Istituto Lama Tzong Khapa and teacher of the Masters Program! Here we go... the pictures here are recently captured on the constructions site, as you see the Upper Block is nearing completion, with railing and floor of the veranda is painted red. We expect to finish works in the coming a few months, however it may take more months as the crop harvesting season for the local Indian workers and laborers is approaching fast, besides our limited resources and funds for the projects are another reasons too. 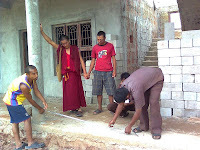 The 10 meters depth Septic Tank has been dug in the very front of hostel veranda, and the waste water-passage and pit have been dug behind it. 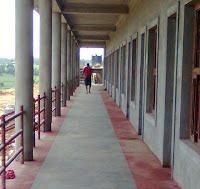 The Construction Executive and the wielding man are taking the measurement between the pillars of the hostel for the railings in the Lower 2nd Block. The new railing will come up shortly. Even before the summer break, the student worked so hard cleaning the dirt stained on the window grill and the railings with sand papers even in the heavy rain. They also dug up the waste water drainage whole day to save the constructions cost. Our Thanks goes to our students for their cooperation and collective efforts in any way in all-round development of Ngari Khangtsen. The ‘Chabshug’ or pronounce Chapshu is a week long summer break in the monastery after a long period of Yarney or summer retreat. The entire monastics strictly observed the retreats for a month and a half in the monastery. Even during the holiday, many great Geshe and senior monks remain in the retreat centre doing prayer, visualization of root guru and deities, accumulation of mandala and prostrations as strict dharma practitioners. The younger monks spend the summer holiday by playing games like carom board, table tennis and enjoying education related movies their own Khangtsen . Thank You India ! Making Home for 50 Years…!